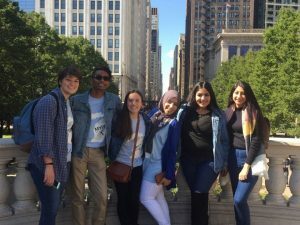 Hi, we are Abhijay Kumar and Jordan Scrimger, members of the Metropolitan Youth Policy Fellows (MYPF), a diverse group of youth working together for a better metropolitan Detroit. The MYPF, which includes members from multiple communities —across cities, neighborhoods, and suburbs – formed in order to participate in issues that impact our lives. We think it is important that youth have a voice in policy decisions. Youth know what is going on in their communities and have ideas for solutions. The first project we undertook was a survey (N=1,191) asking youth to identify issues in their communities. Afterwards, we engaged youth in focus groups (N=53) to hear more about ideas they had for change. We gathered valuable information and created a report, making these findings and recommendations accessible to everyone. Reflect on your power and privilege. Acknowledge resources where you possess privilege, like networks, funding, knowledge, etc. and recognize how it can be used to optimize youth efforts. Provide space, be easy to access, and invite conversation. The belief that adults and youth are equals and that the exchange of ideas is bidirectional creates a more enriching and productive atmosphere for all. Be a “coffee filter”. Rather than change the flow of thoughts, facilitate the refinement process towards a goal. Get youth voice and input. Youth should not be an afterthought. They should be provided a platform to directly influence policy-making. Treat youth as allies, not like a burden. We want a voice in the way that our lives are decided. Our viewpoints can provide valuable insight into the world that could only be conveyed through collaborations with youth. Don’t tokenize. Offering youth an authentic way in which their ideas can be taken seriously and with the intent to problem solve is essential. Ask us! Don’t make assumptions. Decisions that are made must be representative and inclusive of candid youth perspectives. They should be actively involved in the decision making process, as youth can help ensure that good intentions reap positive impact. Our work with participatory evaluation led to a report that was disseminated to the Michigan Civil Rights Commission.